In the world of home security, smart technology was the biggest buzz of 2014. In theory, smart technology is beautiful in its simplicity; link your world by accessing everything in your home anytime, anywhere using your mobile device. Smartphone integration was already a feature of smart thermostats and TV controls when additional appliances were added and we now have smart fridges, smart ranges, smart dishwashers, smart microwave ovens, smart lights – well, the list could just go on and on – but, you get the picture? The home security industry stepped up to the plate offering smart lock and smart key technology. The smart door lock is the hi-tech replacement for the classic lock and key and works with a corresponding smartphone app or keychain remote (without buttons) called a fob. As the homeowner steps up to the lock and engages the fob or the app, the lock will automatically unlock. They are battery powered, lasting for about a year before the batteries need replacing. The majority of smart locks use Bluetooth 4.0 to communicate between the lock and your smart phone although some locks use Wi-Fi and NFC. Your smart lock will notify you immediately with a text or email to you mobile device when your home is accessed via the smart lock. The same applies if someone tries to mess around with the lock. Almost every smart lock uses the traditional lock and key system as backup in the event of a power outage or if a user does not have access to the app or fob. Most locks are customizable, allowing you to set rules, modes and code temporary permissions for service personnel, dog walkers or the babysitter. Like other smart technology, the smart lock is designed to be convenient. You’ll never have to physically go to the door to let in a guest and if your hands are full, when arriving home, you’ll still be able to open the door. 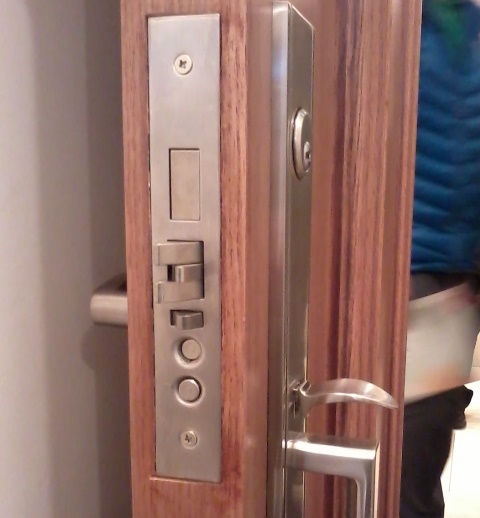 Are these locks really safer? What will happen should a thief get a hold of your phone? He wouldn’t even have to break in, just saunter up to the front door and walk right in. Stolen or lost phones can quickly be disabled depending on the make of smart lock. The app can be accessed from another device and disabled or via the company’s support line to have access permissions removed on your missing phone. Traditional locks have been around for a long time (about three centuries) and burglars have had a lot of time to work out ways to get around them and through them. Lock picking, specifically lock bumping, is one of the most common ways to break into a home. Smart locks that utilize a back-up lock mechanism are equipped with anti-bumping technology, further security against this familiar burglary technique. Smart technology relies on electronics and any utilizing a network connection can be vulnerable to hacking. Security concerns raised about the new smart technology point out even smart fridges are getting hacked. By coupling traditional locks to the “Internet of Things” crooks are given one more platform to exploit. Although, even high-tech smart locks can be compromised using a simple hammer and wire there are other drawbacks too. A traditional lockpicker always leaves some evidence police could use to catch the perpetrator. But anyone in front of a computer terminal can do the unlocking remotely. Some security concerns have to do the newness of the technology – there are still kinks to be worked out. People don’t understand the downside of connecting everything in their life to the Internet, especially relating to security but smart technology is rapidly evolving and it’s here to stay.